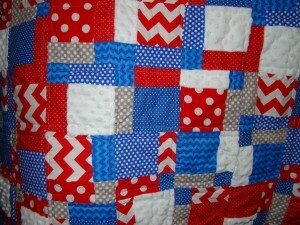 Home » Posts Tagged "disappearing 9-patch quilt"
Today’s quilt is another special one. Ok, ok, technically they are all special rainbow unicorn snowflakes, but this one is extra special for a few reasons. Not only is it my first twin size and first disappearing 9-patch quilt (click here for a great tutorial), it’s also made for a family friend. Sharon’s daughter, Haley, is a softball ROCKSTAR, which means Sharon goes to a lot of games. She wanted a quilt to take with her to sit on the grass or cover up with at night games. (They assure me it does get cold in Mississippi…I have my doubts! 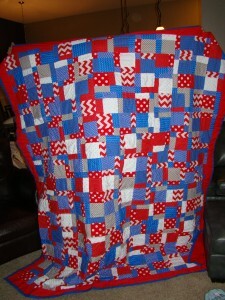 ;)) Naturally, this quilt had to be done in team colors: red, blue and white. Without further ado, here is the Haley quilt!